So even Anne suffers from this disease. At least I’m in good company. I once talked with a friend at a writing conference held in a Mexican restaurant. She told me about the novel she was working on and how her publisher had requested the historical setting–the same setting I planned for mine, one I thought was unique. That’s about the time the green guy appeared at my shoulder with a bowl of chips. I threw the jalapeno fire sauce in his face. Sometimes that’s the only way to handle that green guy. But you know, that might have been when I quit seriously working on my own book–as in thinking about plots and characters and doing research. Not in as actually writing. Unless you count the first bit I wrote and shredded. I ignored the fact that sometimes one’s success breaks the ice for others. I still haven’t read my friend’s book. And that green guy still shows up every so often. It’s enough to make you throw yourself down the back stairs, as Anne says. I squished him between the covers of One Month to Live: Thirty Days to a No Regret Life and Dorie, the Girl Nobody Loved. It’s not that I’m not happy for my friends. I am. Honest, I am. Afraid that I might never realize my dreams in the time I have left, afraid others will use up my ideas. Angry at myself for dragging my feet and procrastinating all these years, for not maintaining discipline and order, for not arranging a consistent writing schedule, for falling prey to perfectionism. I have to remember how much He loves me (us), how He never leaves us and never leaves us out, and how He wants to love others through us. I have to pray for a tranquil heart which is a good medicine for what ails me. Whether I write another word or not. I really need to read my friend’s book. Or maybe I should just put my feet up and watch Duck Dynasty. Do you ever struggle with jealousy, whether in your writing or some other area of your life? How do you deal with that green guy? A good, honest reminder for all of us, Sandy. Lord knows I’ve batteled jealousy time and time again. I am constantly guarding my heart against this, because really, it is poison. Nothing kills my creativity and joy faster than being envious of others. Bless you, sweet friend!! That comparison thing. We so need to stop it. At least when we compare ourselves to others. Our plumb line is Jesus/Word. Empty vessels, we… so He can pour His creativity through us. Just look at the variety in nature. Why would He stop with us? This was a great read, and a great reminder that God DOES have a plan for all of us. My battle with the green eyed monster has been a long one. As I get older I’m more secure with myself and the path God has chosen for me. …It’s still nice to be reminded. Yes, that monster often rears his ugly head when we are not secure enough in who we are in the body and with who God made us to be as individual masterpieces. I sometimes feel like I’ve thrown hot salsa on His plan… but need to be reminded that He knew I’d do that and that He ultimately works it all into a grand design. Brave girl! Except for the salsa I can relate. I usually share a bowl of M & M’s with that devil sitting on my shoulder…ok not really, but still, you tackle so well, with open arms and bring light to the voices the enemy whispers. Amen to squishing the voice that allows us to believe God is not gracious enough to steward well, that which He gifts is His own. Thank you- so glad I caught this in the feeds today! M&M’s? I’m so up for those! But only if they’re unadulterated originals. I’m so glad you came by today, Dawn. And yes, I think we sometimes spend too much time hiding in the shadows. The light appears when we step into it. Wait until you see that green river! And the Blue Hole. Oh yes…..he shows up very often and I have to get that jalapeno fire sauce handy as well. I feel so bad because I was smiling all through this post and I really don’t think that was your intent, and yet those feelings were so familiar it was like you have peered into my own heart! 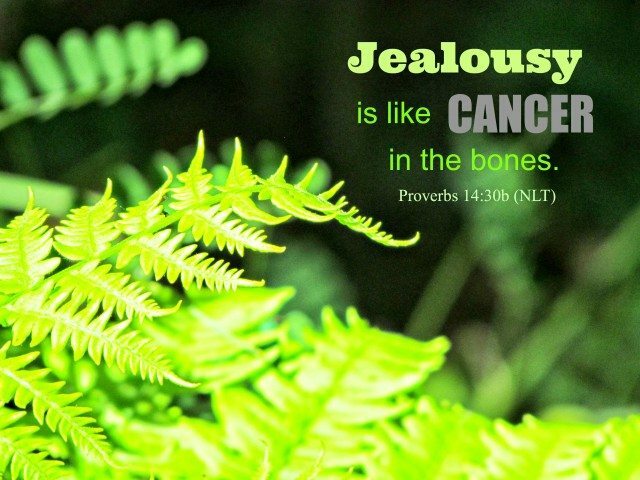 I guess there is a reason there are so many Scriptures that deal with jealousy. Good job with this, and adding Anne Lamott? Perfect. And I really need to add? That after reading your profile again….you live on 50 acres (GREEN) and you live in an old farmhouse (GREEN, GREEN) Now I have to kick that guy off my shoulder, again! Shawn Smucker once suggested to me that every time I feel the twang of envy or jealousy (which I do like, a bajillion times a day), I should immediate tweet or FB or comment on someone else’s achievements – promote someone else. A gesture of goodwill takes the wind right out of envy’s sails, he said. You know what? It totally works. I do it all the time. Great, honest post, Sandy. We all need to hear this and know we don’t suffer alone. Thank you, Michelle. And Shawn. Super awesome, powerful medicine! So . . . Now I’ll KNOW when the jealousy bug has bitten?? This is a great idea and one I’ve actually tried to practice. You’re right, it does help. Oh, I’m so glad, Emily. Thanks for coming by. Exactly what I’m struggling through. Susie sent this to me to read, b/c she knows what I’ve been going through for many years, re: writing, publishing, acting, directing, on and on and on… and how I feel that I have been dumped aside. My husband recently said that even if one person reads the handwritten/computer-oriented books, stories, I’ve written, and the Lord’s seed is planted in that heart, that’s what should count. I sometimes think of myself as how one of those main artists, van Gogh, committed suicide b/c his paintings weren’t being sold, yet. Now… they are all around the world, and he is gone. That’s a good reminder for me to just do what I can and trust the Lord with the results. Thank you so much! Isn’t that what we’re trying to do–point to God? A few months back, the THC book club discussed Tim Keller’s book, Every Good Endeavor. In it, he tells about a story Tolkien wrote (based on a dream) called Leaf by Niggle. I wrote a reflection here. And one more thing. You are sowing so many seeds, Joanne, with your life, with your words, and with your photos. And your husband is right. We should all take his words to heart. One thing that’s interesting about the whole blogging world is that it presents so many new opportunities for jealousy. 🙁 Just a few years ago it didn’t even exist; there was nothing to envy. But now. I guess it just proves that it’s our heart that’s got the problem, not the medium. Thanks for this authentic look at what many of us deal with, including me. I definitely need the covering of grace! “Our heart’s the problem.” Oh, isn’t this at the root of so many issues? How we need grace! Been there, done that! It’s a killer to the soul, for sure. Is it any wonder that “Thou shalt not covet” is one of the big 10? One of the big 10. No kidding, Martha. I think jealousy was birthed with Cain and Abel. Or was hidden in an apple seed. “using it as material”… 🙂 just so you know there is plenty here and over there at the blog I linked from to cause some greeny-ness to grow. If I said otherwise, my nose would be growing too. Ha! Chances are my nose is longer than yours. I do love how Anne suggests using this issues as material. Somehow getting real and sharing seems to diminish their effect. You are brave to expose your heart and struggle, but look how it opens people up? This is a real issue that we can deal with spiritually by at first recognizing it. Your personification of the green guy gives us something to visualize when we start entertaining these jealous thoughts. I’m glad you were able to share this with the Bible Dude readers, because it’s nice to know we aren’t alone. Yes, ma’am. I do struggle with this. In fact, I’m writing a post right now entitled “The day I admitted I’m jealous of Ann Voskamp.” How’s that for ugly? I’m struggling, in case you can’t tell. 🙂 Nice to know I’m not alone. It’s a gift to travel with you, too, Elizabeth. Do you suppose anything good would come out of making a pinata out of the green guy?